Art Deco Houses - Streamlined or Skyscraper Influence? 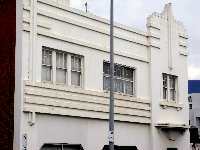 Art Deco houses exist in towns and cities all over the world. They were mostly built in the 1930s once the streamlined style pioneered by forward looking architects such as Le Corbusier and Frank Lloyd Wright had filtered through to the rest of the world. Interestingly, Paris, the birthplace of Art Deco has very few Art Deco buildings. In Paris, it was mainly a decorative style, led by the fashion houses, furniture craftsmen, jewelers, and artists. It was once the style had crossed the channel to the USA, that Art Deco architecture took off and then spread throughout the world. 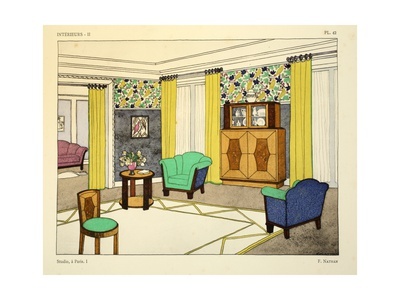 But Paris holds it's own when it comes to Art Deco interiors, as they were the birthplace of jazz age decor and design. Illustration from 'Interieurs' by Leon Moussinac. There was a definite influence from the sea and the ever popular ocean liners of the day. White streamlined houses, with balconies that could be from a ship, and portholes for windows can be seen in seaside towns from England to Australia, and even inland too, like the house above in the Blue Mountains of Australia. Streamlining came from the obsession with speed created by the development of the fastest motor cars, ocean liners, trains and planes during the 1920s and 30s. Read more about Art Deco Transportation and it's Influence on Art and Design. Everything from the refrigerator to the vacuum cleaner had to be streamlined, so of course the most stylish house designs took their influence from this design craze too. 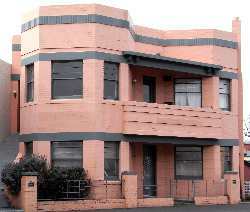 There are other Art Deco homes which perhaps take more of their influence from the geometric or skyscraper designs, with stepped roof lines and parallel line detailing. These also appear throughout the world, but this design perhaps appears more frequently on high streets for retail stores, and for public buildings. My aim on Decolish is to display some of the best Art Deco homes from around the world. The following two photos are ones that I took while wandering around Hobart, Tasmania recently. So I need your help. Maybe you have the best Art Deco house on the block, or there is a great one in your street. 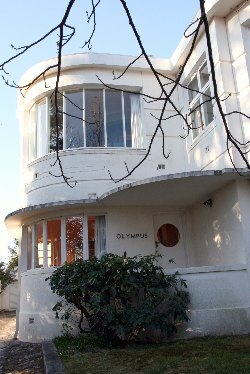 You can create your own webpage about the best Art Deco house right here on Decolish. Other readers will be able to rate your entry and post comments. Please be mindful of the privacy of home owners when posting stories or photos - make sure you don't reveal the address, or even better get permission of the owner first. The house at the top of this page belongs to a lovely lady I met, who told me about her home and invited me to take a photo of it. Actually my brother took this photo for me.